Wild, striking design and potent, pristine sound make Blue’s Ella headphones a killer choice for any listener. Companies like Sennheiser, AKG, and Shure found out long ago it’s not much of a stretch to go from expert microphone maker to headphone baller. Blue Microphones, designer of some of the wildest looking studio microphones on the planet, has carried that wisdom from its iconic predecessors. But Blue wouldn’t be Blue without bringing its penchant for retro-cyberpunk design to the table, beginning with 2014’s utterly intriguing Mo-Fi headphones. Blue’s latest effort has led to the playfully named Ella. 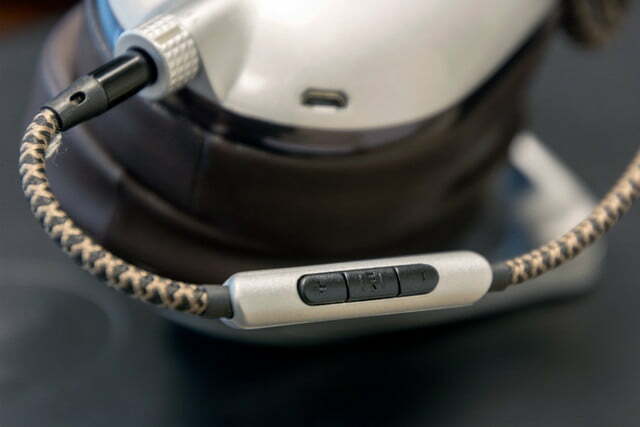 Like the Mo-Fi, the Ella employ a spaceman-style headband crafted from heaps of lush padding, shocking lines of arched metal and plastic, and more hinges than Optimus Prime to facilitate a self-adjusting, custom fit. 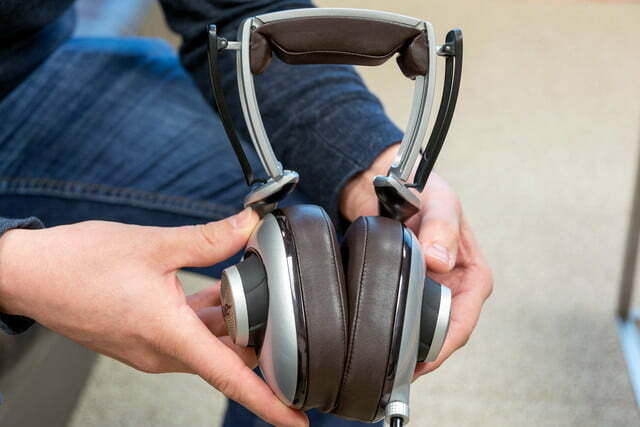 However, unlike the Mo-Fi, the Ella also employ planar magnetic drivers for crystalline sonic clarity that few headphones in their class can match. 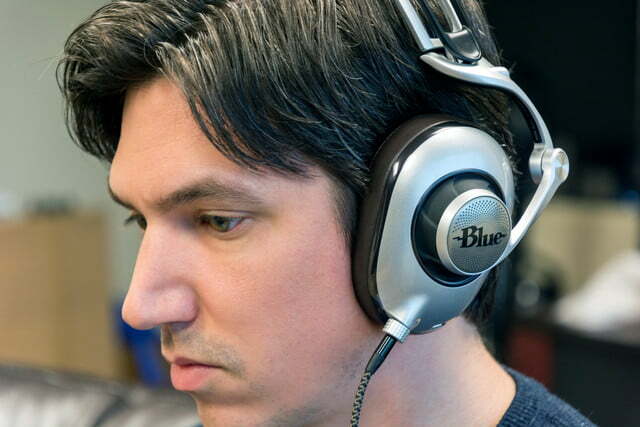 In fact, the Ella’s mix of daring design and brilliant sound may just make them Blue’s coolest headphone to date. It’s hard to overstate how crazy the Ella look — especially for those who missed the Mo-Fi. Raising the lid of their cubed box reveals the Ella posed upright, their gleaming headband clutching silver earcups hunched backward at an angle, presumably swiped from a ‘70s throwback exhibit at Seattle’s Museum of Flight. The topside of the cans can only be described as an “apparatus,” striking an aesthetic that looks something like the metallic skeleton of the Terminator — if the Terminator was in fact a headless stork. 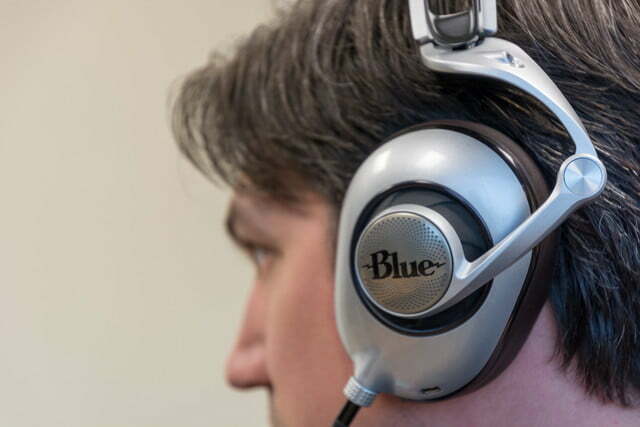 Blue’s Ella offer a vivid expression of clean and clear sound. Strange as the headband may appear, the design is exceptionally effective — there’s nothing wasted here, and the ball joints and hinges all work together in perfect harmony as you pull the cups out, or release them to clamp back together with taut force. 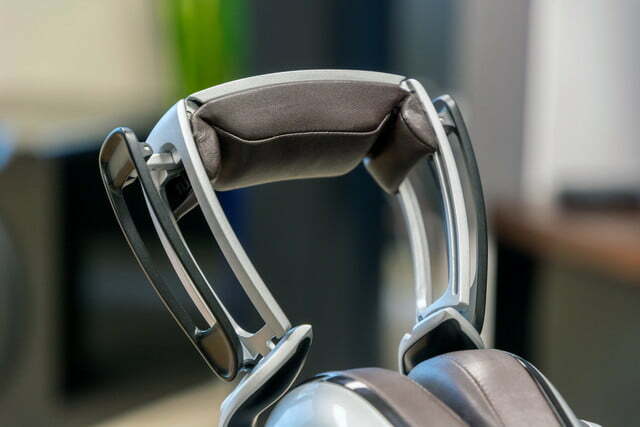 Despite their many moving parts, the headphones feel robust and extremely well designed. Inside the box is a solid collection of accessories, including a crazy-long (3 meters) braided cable for studio or desktop leeway, a braided iPhone cable with inline iOS microphone, a quarter-inch adapter, a slate felt pouch, and a USB cable to charge the headphones’ built-in 250mW amplifier. 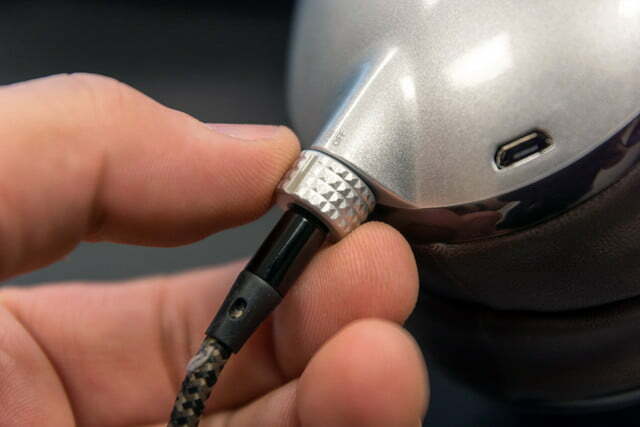 As we noted in our Mo-Fi review, the Ella’s design is far from some wild vision cooked up in a fever dream. In fact, it’s Blue’s answer to creating a custom fit for every user, designed for a better seal to enhance performance and comfort. To that end, the earcups are loaded with foam padding cloaked in supple leather-like material, as is the band above. With that said, the futuristic design brings its own coolness factor, and the extra weight is for good reason. As touched on above, the Ella trades traditional, piston-style speaker design for planar magnetic drivers. These micro-thin membranes (like thin drum heads) are layered with circuitry which is excited by a magnet to create sound. While that leads to heavy components — Audeze’s similarly matched EL-8 planar cans also weigh over a pound — it also leads to incredibly accurate sonic reproduction. In addition to being heavy, planar drivers also require a lot of power to function properly. Brands have found novel ways to solve the planar power gap for mobile use, including Audeze’s Fluxor Magnetic technology which allows one side of the magnet — the side facing the driver — to efficiently leverage available power from inferior sources like a smartphone. 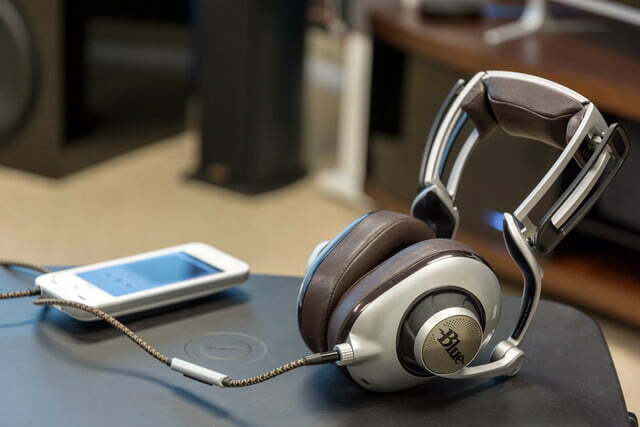 As with its Mo-Fi cans, Blue’s solution is to load a custom amplifier right into the Ella. In keeping with the Ella’s minimalist design philosophy, the amp control switch is nearly invisible, fastened right onto the only extrusion on the earcups, the 2.5mm audio input port. In fact, if you’re not aware it, you’ll likely miss it. Twist the switch forward to turn the amp on, and twist it another notch for “On+,” which serves as a sort of bass boost for lighter recordings. In another clever design cue, the amp turns off when the earcups press together. While the Ella perform just fine in the off position when powered by a quality headphone amp, savvy listeners will appreciate the extra zip in presence (and volume level) afforded by the on-board amp when used with a phone or tablet. The amp requires battery power, of course, lasting around 12 hours on a 3-4-hour charge, but the cans won’t be out of commission if you forget to charge them. Turning the amp on creates a cool glow of blue-white LEDs behind the Blue logo to let you know it’s engaged, but we wish Blue would have included a clear battery status LED to indicate when juice runs low. We’ve poked some fun at the Ella’s weight and clamping force, which are more aggressive and/or intrusive than we’d like. The cans are especially awkward around your neck, subtly clasping your throat to let you know they don’t belong there. 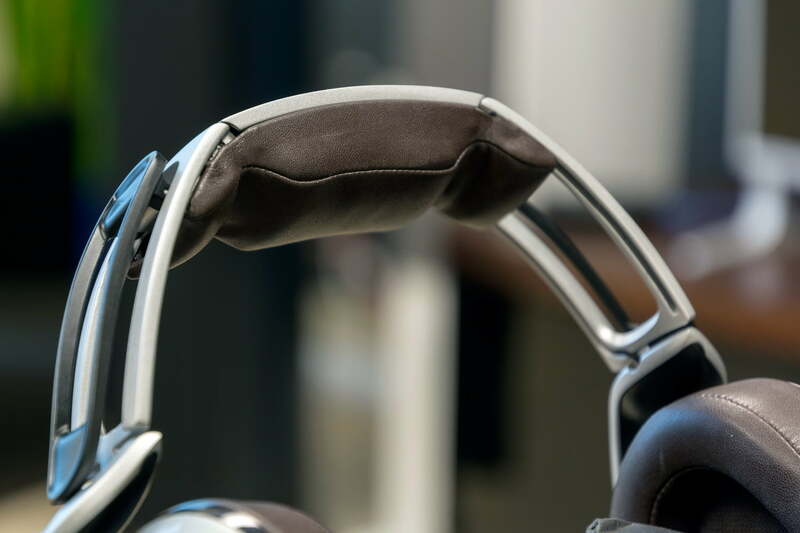 Still, while it’s not the most luxurious fit in our headphone arsenal, the weight is balanced about as well as one could hope, while the healthy foam pads keep outright discomfort at bay during even lengthy listening sessions. 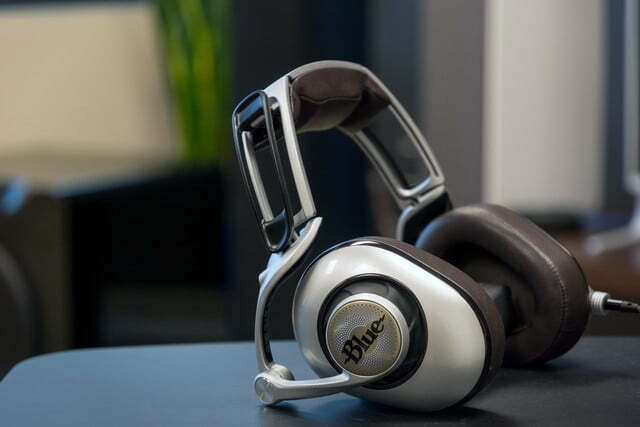 As we’ve come to expect from a refined pair of planar magnetic headphones, Blue’s Ella offer a vivid expression of clean and clear sound wrought with detailed reproduction of instrumental textures, a wide and well-balanced soundstage, and the kind of fluidity and presence in the upper register that traditional dynamic drivers struggle to achieve. We were pleasantly surprised to find the Ella holding up well against our go-to planar cans at their $700 price point: Audeze’s brilliant EL-8. That’s surprising, not just because Audeze has been in the planar game longer, but also because Blue’s version are one of the relatively few examples of planar cans with closed-back earcups, carved into what Blue calls “acoustic chambers.” This design gives the cans a less airy sound than the EL-8, and less dimensionality and space in the grander picture. But the Ella’s soundstage is far from narrow, expanding broadly into a wide and spacious stereo image. We’d listened to the Ella for some time in the background while working on other projects, but the first moment we actually heard the cans in all their glory was when The Naked and Famous track The Sun popped up on a Spotify playlist. The song was startlingly visual from the start, allowing us to almost see the interior caps of the earcups buzzing with the electronic vibrations of distorted bass, cast grandly from the sides of the stereo channels. Droves of synthetic effects were rendered in glossy waves of laser light across the stereo path, while the guitar solo seemed to fire between the earpieces like arcing bolts of lightning, wrenching in wild convulsions of sonic sparks as it moved dimensionally through the soundstage. That kind of sonic reverie is common with the Ella, and also more plausible in noisy environments than open-back cans, thanks to much better passive noise isolation. Vocals are crisp and silvery in space, the soft and supple lip movements of singers like Nickel Creek’s Sara Watkins effortlessly popping forth with cutting presence. Horns come in splashy waves of brass, while guitar and percussion tracks are rendered with crunchy textural expression, allowing you to dig into those deeper layers and explore the core sounds. The ball joints and hinges all work together in perfect harmony. Turning to inferior sound sources, such as our iPhone and laptop, we noted some extra shimmer to tonal color when engaging the “On” setting of the onboard amp, not to mention plenty more volume — don’t turn the amp on without cranking the volume on your device down first! The “On+” effect will likely please those looking for a bit more warmth and authority in the lower registers as well. 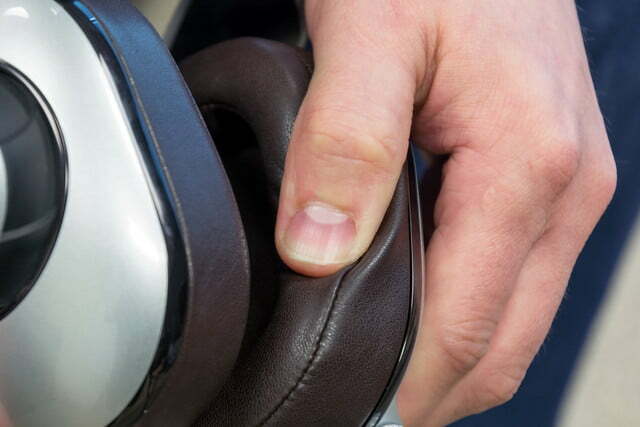 It’s a welcome option, and one we rarely encounter in hi-fi headphones. Silver is a word we returned to often in our evaluation — it helps define the Ella’s lighter overall tonal color in comparison to the rival EL-8, which offer a warmer and more organic flavor. We tend to prefer the El-8’s deceivingly soft approach, especially when sourcing our Astell & Kern AK Junior hi-res portable player. With or without the on-board amp engaged, the Ella struggled a bit to build out the EL-8’s spacing and instrumental depth on 24 bit/192kHz tracks like Steely Dan’s Josie. Though they still sounded fantastic, the Ella couldn’t quite recreate moments like the EL-8’s effortless powdery glow in the crash cymbals there. The differences were less apparent when playing back lower resolution tracks via our squeaky-clean Antelope Zodiac headphone amp, especially when gliding through the dark and glittering aluminum drainpipe of Depeche Mode’s Violator, where the Ella leaned into the tight electronic instrumental timbres with verve. We were treated to some goosebumps, in fact, when we called up Sweetest Perfection, where the Ella unearthed sunken facets of detail and a more prominent placement of the demonic lower octave in the right-side vocal line than we’re used to, making the tune even more eerie and ominous. Blue offers a two-year warranty for operating defects including all necessary parts and labor. 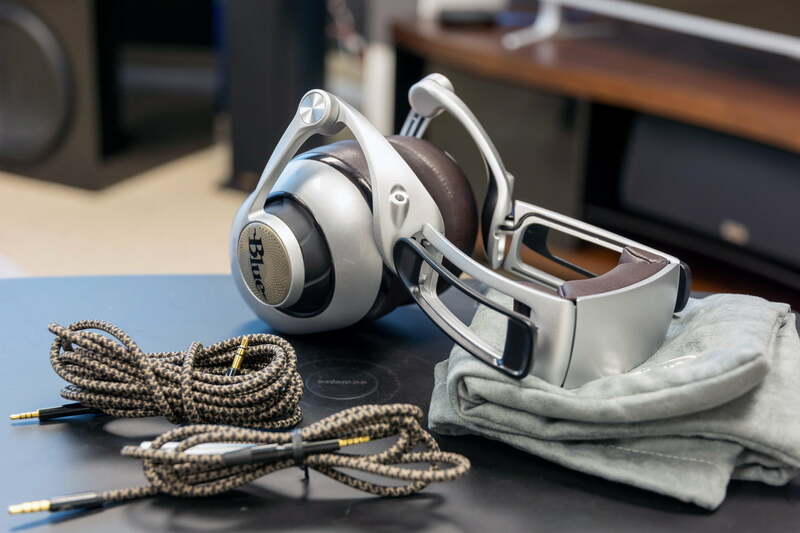 Wild, unique, and striking in design, Blue’s new Ella headphones pack impressive sound beneath their gleaming silver surface, making for another killer option in the mid-level hi-fi set. Blue Microphones have cultivated an impressive reputation in the studio world for their hearty microphone designs, and that carries over well into their headphones. The Ella look and feel extremely well built, and should last for a very long time. The obvious alternative is the Audeze El-8, which we still prefer due to comfier fit and more organic sound performance. That said, the Ella’s closed-back design make them more versatile, and the on-board amp set them up well for travel, especially for those who don’t mind a little extra grip. If you’d like a bit more portability, and don’t mind trading some detail for dollars back, we’d also suggest checking out Audeze’s impressive Sine planar magnetic on-ear headphones. As long as you’re up for a helmet-like fit, then you should absolutely consider the Ella as a top contender. While certainly not the most low-key (or comfy) cans we’ve encountered, Blue’s Ella take a mighty seat next to hi-fi titans like Audeze’s EL-8, offering some of the best sound at their price point on the market — and a look you won’t find anywhere else.